During the festive season Brisbane city is decorated with hundreds of Christmas trees, metres of tinsel and thousands of fairy lights. I've created a list of my favourite Brisbane city decorations. Read on to see who made the list. Top of my list of favourites is the iconic Brisbane Arcade which looks absolutely stunning this Christmas. I was mesmerised by the beauty of their decorations which include 1400m of fairy lights, 1500 baubles, over 1000m of crystal strands, 250 stars and 200m of monogrammed ribbon. Without a doubt the Brisbane Cartier store has the most stylish Christmas shop exterior in Brisbane city. Boughs of thick green pine sprinkled with fairy lights decorate the shop windows on the corner of Edward and Elizabeth Streets. 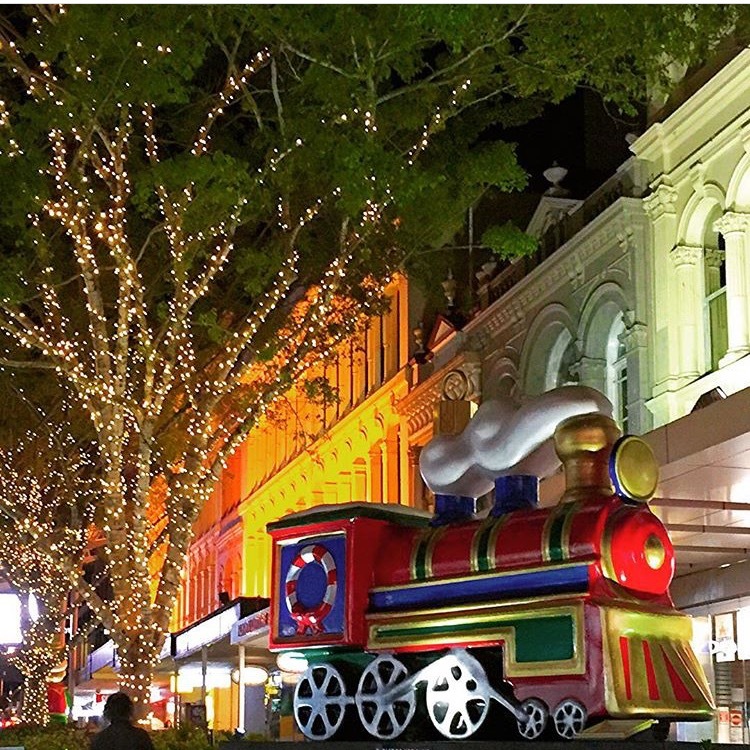 Brisbane's Queen Street Mall is decorated with 6 larger than life colourful Christmas decorations. A toy solider, teddy bear and elf, to name a few, stand proud during the day then come nightfall the decorations are light up and sit under sparkling fairy lit trees. Iconic American jewellery designer, Tiffany, have captured the magic of the festive season in their QueensPlaza store. They have filled our eyes and hearts with sparkle with their Christmas window displays and Christmas trees dressed with crystal ornaments and their iconic Tiffany blue boxes. Located within the foyer of the Riverside Centre, at 123 Eagle Street, stands the most magical Christmas tree. Decorated with boughs of white decorations with touches of purple and intertwined with fairy lights the tree stands proudly topped with a glowing star. Do you have a favourite Bris-mas decorated location?